This research project in NTT Communication Science Laboratories has ended. 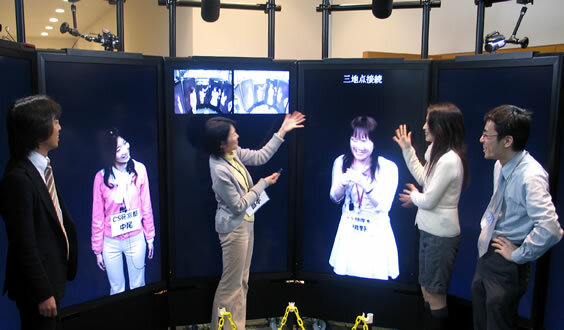 t-Room is a room-sharing video system that allows people to simultaneously experience “distant space” and “remote time”. t-Room preserves positional relationships between people in distant sites. t-Room allows consistent referencing across distant sites. t-Room provides people in distant sites the feeling of co-presence. t-Room help people in distant sites to build rapport. t-Room allows people to move around in each room, maintaining the spatial relationships between people in distant sites. t-Room enables people to access spacio-temporal memories in the past. t-Room enables people in different sites and time zones to share the same space and time. t-Room allows people to embed themselves into the past space. t-Room enables people to re-experience what was happening in the room. The re-experience can also be recorded. t-Room allows people to “quote” previous events just like communicating over email quoting each othe's message. t-Room consists of multiple screens and cameras on walls. The room layout is replicated at all sites; everything inside the rooms is mutually projected on another room's screens. Video cameras and displays are configured to maintain spatial relationships between distant sites. Similarly, microphones and speakers are configured to maintain the spatial localization of speakers across distant sites; sounds are localized to support selective listening. Meetings are recorded by cameras, microphones, and other sensors as well as advanced user interfaces and software systems. People can quote, add and edit the past meetings just like communicating over email. They can also pause, fast-forward and replay the past meetings.